Young Indiana Jones Chronicles Adventure knife gift set mint in the box. It is a four blade multi-blade knife with clear picture handles. 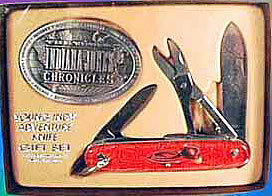 The pewter belt buckle is oval with the Young Indiana Jones Chronicles logo on the front. Young Indiana Jones Chronicles Adventure knife gift set mint in the box. It is a four blade multi-blade knife with clear picture handles. The official pewter belt buckle is oval with raised relief design of the Young Indiana Jones Chronicles logo on the front. On the back is ©1991 Lucasfilm Ltd. The first show started in 1992 and the last show was in 1996. The knife is made in the USA and is 3-3/4" closed. On the front picture handle is the famous Stetson brown felt hat and leather whip. On the back side is a world map with the International Morse Code. The pewter belt buckle is made in the USA and is 2-11/16" across the oval. The buckle will take up to a 1-1/4" wide belt. On the back is " Before the world discovered Indiana, Indiana discovered the world". The complete set was made by United Cutlery and was authorized by Lucasfilm. The knife was probably made by Camillus. Another photo of the knife but a near mint one.